On the afternoon of Dec.16th, the last wonderful event of 2018 “I love Changzhou” Expats Salon was held at Modern Mass Media Center, the tallest building in Changzhou. The theme of this event is “Enjoy the bird’s eye view of CZ on its tallest building, experiencing news anchor and greet Christmas”. 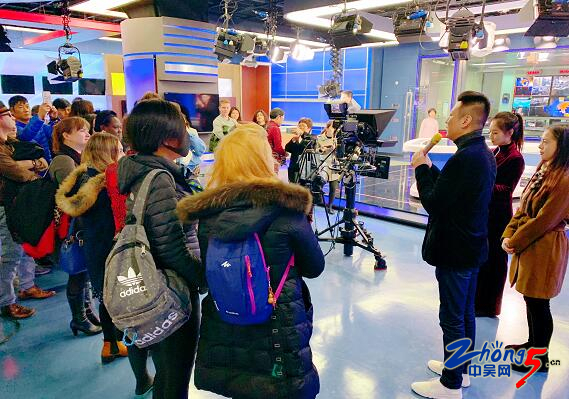 Some 40 foreign friends from all walks of life in Changzhou visited the news studio in which i have been working for over 16 years and experienced working as a news anchor. 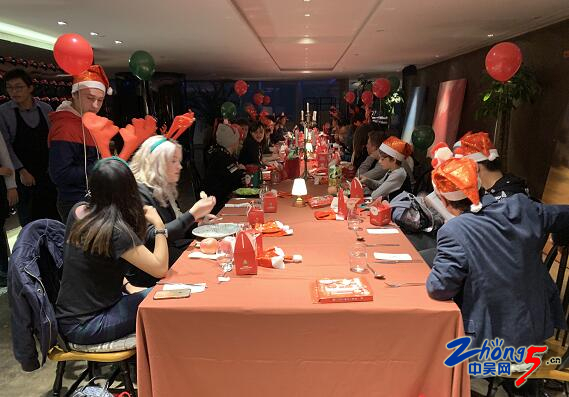 At the 52 Sky restaurant in the tallest building of Changzhou, foreign friends enjoyed the incredible view of the city and impressed by the rapid development of the Dragon City in recent years. The I love Changzhou Expat Salon is sponsored by Changzhou Municipal Publicity Department and Changzhou Bureau of Commerce as well as Changzhou TV Station. Our goal is to create a platform for the foreign citizens in Changzhou to know more about the culture and to feel like part of the city itself. We hold 4 or 5 events each year. So we are opening our arms for you to invite more expat friends to join upcoming events. We cherish your friendship and realize that you contribute to the richness of our city. Christmas is coming and i know a lot of netizens are out of the town. Here I wish everybody Merry Christmas and Happy New Year! Why is good citizenship important in society?Citizenship exists in every corner of our lives. We can't avoid it or ignore it. With citizenship in our mind，we are supposed to take on responsibility whenever necessary. Thus the society would become harmonious without too much regulation. citizenship means the status of a citien with rights and duties. Firstly, the correct exercise of citizens' political rights is conducive to safeguarding their own legitimate rights and interests, and is conducive to safeguarding social fairness and justice.Secondly,the active performance of citizens' duties is conducive to more stable and harmonious society, to the fuller realization of citizens' rights, to the improvement of the moral level of the whole society, and to the formation of a good social atmosphere. CitizenshipCirizenship is a fortune given by the country people belongs to.First of all, in everywhere people will be divided into different hieracy, which just refers to the talent, behavior, habits,hobbies and individual efforts rather than something like discrimination or inequality. With regard to society, people with citizenship are really superior to people without it. Moreover, citizenship gives people both rights and duties, which is important to assist the run of society.There are also many other meanings of cirizenship, and consequently we can say that citizenship is vital to society. Self-disciplineSelf-discipline is the basis of a harmonious society, which needs people to do simething the should do and avoid something they are supposed to keep away from. Without self-discipline, our society may well become its initial state. To ourselves, assumption are that we will abandon the good habits and persue something that can merely excited us temporarily, which ultimately does damage on our health and other aspects. To society, the rid of self-discipline connotes that people are likely to go against constitution and ethic rules.If it happened, the society would be in a mess. Under such circumstance, nobody can enjoy the happiness of life.What a terrible condition! Without self-discipline,describe a society.Self-discipline is becoming more and more important in different areas.Equipped with Self-discipline,we fulfill the pledge made before others and ourselves.However ,without Self-discipline,we are unable to find the best way to deal with problems efficiently. Instead,we are driven to anything unwillingly.That's a vicious circle. As a result,the society would be in a mess with everyone bustling about but found nothing vital to accomplish. Moreover,the speed of the development in society is torpid ,making peoples living standard declining. Without caring in the world ,what would happen ?Caring is one of the primary components of human quality ,it applies to every aspect of life.Without caring,the patients would feel helpless and hopeless,children would feel lonely and single,students would feel boring and distant......When there is an old man slipped,nobody would give him a helping hand,that sounds absurd ,but it indeed happens around us.I don't want to see a world without caring ,such an attracting quality should be kept in everyone's mind.As a result ,the society would develop prosperously and warmth would be handed one by one. Perseverance plays an important role in my daily life.Whenever I meet with difficulties ,it is perseverance that supports me to keep going on. The quality also serves me in my hobbies. When I first learnt calligraphy,I found it boring and hard to imitate,however,I told myself just hung on there one more time and finally I achieved the highest level in this area. It was something I am proud for due to my perseverance. I think i must have perseverance in my English learning.Because the process of learning language is such a long time,students not have the desire for learning,but also keep on doing it.The winner is one who can sticking till the last moment.